The VMware remote command line interface (RCLI) in ESX 3i adds versatility to virtual servers through scripting for automation. Learn how to download, install and use it. Most people suggest that VMware ESX Server 3i is similar to ESX Server 3.5, except that 3i doesn't have the Red Hat Enterprise Linux-like command line from the service console. Many people concede that ESX Server 3i simply doesn't have a command line interface (CLI). But in actuality, ESX Server 3i does have a CLI – a remote CLI. In this article, I will show you how to download, install and use it. The remote CLI provides a way for you to perform commands on a remote VMware ESX Server 3i system. VMware will fully support you in doing this on a 3i system. But while it may work on a normal ESX Server 3.5 system, it is unsupported. and as a virtual appliance that is meant to be imported into a VMware ESX Server and run as a virtual scripting appliance. Not to discount Linux, but I only have space to demonstrate how to install the remote ESX Server 3i CLI in Windows. The virtual appliance that contains the RCLI seems to be an interesting installation method. The Windows CLI is about 44 MB compared to the virtual appliance's 119 MB. As a result, you can certainly obtain the Windows CLI faster than the appliance. By using the virtual appliance, however, you would end up with a functioning "scripting appliance." This is comparable to installing a new application on your system in which there is potential for a Perl or other application conflict. In addition, with the application running on your system alone, only you can use it versus the appliance that can be used as an "always running scripting server". 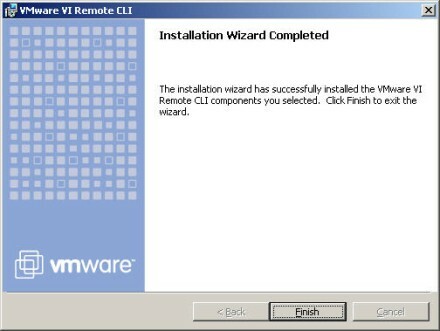 Start by downloading the RCLI from the VMware download center. From there, scroll down to VMware Infrastructure Remote Client and download it. Logging in with a VMware username and password may be required, as well as accepting the nine page license agreement (whew – heavy reading!). Download and installation is the easy part. But how do you really use this new RCLI? How do I use the VMware ESX Server 3i remote CLI? Once installed, you won't see any new icons on your desktop or in your Start menu in the VMware program group. You may see a new program group for ActivePerl 5.8, but it won't have any VMware icons in it. In fact, I had to go back to the documentation to learn how to access the RCLI. Unless you are a command line junkie or a big Perl fan, you might be tempted to just say, "forget it, this CLI stuff isn't for me." However, I hope you will take the time to understand the power of these commands before deciding to use them or not. As with most scripting commands, this isn't something you will learn all that you need to know in a single short article. You'll be prompted for your username and password. Note that any special characters in the username and password should be in double quotes, or should be preceded by a backslash. There are so many possibilities with the RCLI that I can't possibly go into it all here, but you can get full documentation from VMware at the VMware ESX Server 3i website. Once inside, click on the ESX Server 3i Configuration Guide, then the Using Remote Command-line Interfaces section. You should note that in the documentation, you will find a set of command line options that works with every RCLI command to define things like the username and password that you are logging in with. In conclusion, the new RCLI for VMware ESX Server 3i (and functional, but unsupported on 3.5) is a great new tool in the toolbox of virtualization system admins. With the RCLI, we can create scripts to manage our remote VMware ESX Server systems. These scripts really give us unlimited possibilities for automating our virtualization infrastructure. ABOUT THE AUTHOR: David Davis (CCIE #9369, VCP, CWNA, MCSE, CISSP, Linux+, CEH) has been in the IT industry for 15 years. Currently, he manages a group of systems/network administrators for a privately owned retail company and authors IT-related material in his spare time. He has written hundreds of articles, six video training courses - including the Train Signal VMware ESX Server video training series. His websites are HappyRouter.com. and VMware Videos.com.